A successful query result can be downloaded from the Analyze > History tab by referring to the corresponding command ID and query and also from the Results tab of that command. Some queries have larger result sets than the default file size of 20 MB (or configured result file size limit). 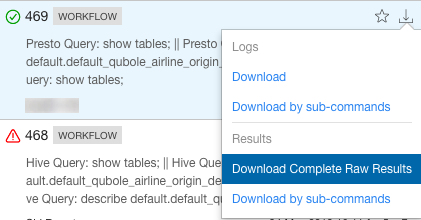 For more information on how to download command results, see Download Results and Logs from the Analyze UI. Data Analytics describes composing different types of commands that you can run on the Analyze Query composer. Select a file or expand the directory to select files, or download all folders and files. You can only download a single file at a time. After making your selection, click Download. Click Close to go back to the Analyze main tab. When you get multiple files as part of a complete raw result download, merge them to see the complete result.